Meet our Massage Therapist Sarah Johnson. Massage Therapist Sarah Johnson or “SJ” originally from Kansas City, MO finally migrated to San Diego after spending the last 11 years on the East coast. She has always had a passion for health, fitness, and just being active. Her background in exercise and fitness began in high school with running track, playing soccer, and dance. She began her fitness career as a Spin Instructor in 2004. She then realized she wanted to do more in the fitness field and obtained her Personal Training certification, TRX Group Trainer Certification, 200 hour Hatha Yoga Teacher Training License and Massage Therapy License. Her desire to be active and goal driven led her to complete several half and full marathons, century bike rides, and various fitness competitions. She is no stranger to mental and physical challenges and realizes that hard work has its rewards. 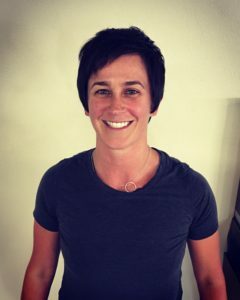 Due to her background in fitness and training, she has an extensive understanding on how the body moves and how to address the needs of her clients via massage therapy. Her goal is to help her clients reduce chronic pain, improve performance, restore range of motion, relax, and overall feel better and lead healthier lives. Meet our Massage Therapist Kyle Reames in San Diego at TruSelf Sporting Club Gym. Massage Therapist Kyle Reames is a San Diego native and has been practicing massage therapy for six years. He is a graduate from Mueller College of Holistic Studies, right here in San Diego. He even studied under Bill Mueller, himself, as part of his coursework.